A romantic hotel, the Betlem Club Hotel Prague 1 is ideal for a getaway weekend for two, wedding accommodations, honeymoons and any other occasion when you want to enjoy each other’s company in the warm romantic environment of a family hotel with a stylish medieval atmosphere and a personal approach to each customer. 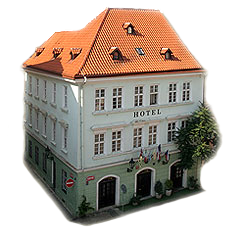 The hotel is situated in quiet Bethlehem Square in the heart of the Old Town of Prague, just a 5 minute walk from Charles Bridge and Old Town Square. It provides an ideal opportunity for walks through historical Prague and cultural adventures. You will have a pleasant stay in one of our 21 cozy and romantic rooms, decorated with wooden furniture and dark wooden beams. The prices include a deluxe breakfast, served in a 13th century Romanesque-Gothic cellar. If you are looking for a beautiful place to spend your honeymoon or wedding stay, please contact us. We will be happy to oblige and handle all the details so you can enjoy the perfect honeymoon.